Does your company still rely on a time-consuming and error-prone manual approach to reconciliation? Does it consolidate multiple data sources from disparate systems to close the books? 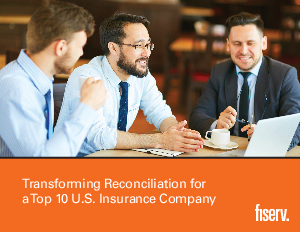 Find out how one of the top 10 multi-line insurers automated the reconciliation process for over 3,000 accounts, resulting in fewer errors and quicker close times. Plus, the insurer now has visibility into all reconciliation items rather than reviewing 300 different Excel reconciliation documents!